A savings account is a great place to keep cash that you don’t plan to spend immediately. These accounts keep your money safe and accessible while paying you interest, but there are several different types of savings accounts to choose from. Each variation (and bank or credit union) has different features, so it’s important to understand your options. Earning interest: All of the accounts described on this page pay interest, which helps you grow your savings — although the rate of growth may be slow. As you compare options, evaluate the interest rate, which is often quoted as an annual percentage rate (APY) to decide which account is best. You don’t necessarily have to choose the account with the highest interest rate — just get a competitive rate. Especially with smaller account balances, the interest rate is not as important as other account features like liquidity and fees. Paying fees? Fees are harmful to your savings account’s health. With relatively low interest rates, any charges can wipe out your annual earnings or even cause your account balance to decrease over time. Examine your bank’s fee statement carefully before depositing money. In its simplest form, a savings account is just a place to hold money. You deposit into the account, earn interest, and take money out when you need it. There are some limits on how often you can withdraw funds (up to six times per month for preauthorized withdrawals – but unlimited in person), and you can add to the account as often as you like. More details: Why Open a Savings Account? There’s nothing wrong with using one of these plain-vanilla accounts, but there are other types of savings accounts that might be a better fit for you. Those other accounts are all variations on the traditional savings account. That said, if your needs are fairly simple, you can probably just open a savings account at a bank you’re already working with and be done with it. These types of accounts were initially available through online-only banks. But most brick-and-mortar banks now include online capabilities like online bill payment and remote deposit, and some banks have online-only options with lower fees and high rates than their standard accounts. Self-service: Online savings accounts are best for self-sufficient tech-savvy consumers. You can’t walk into a branch and get help from a teller — you’ll do most of your banking online by yourself. However, managing your account is easy, and you can always call customer service for help (note that some brick-and-mortar banks limit how often you can call customer service, and they may charge fees for getting help from a human being). Fortunately, you can complete most requests yourself — when and where it’s convenient for you. Linked accounts: To use an online account, you usually also need a brick-and-mortar bank account (almost any checking account will do). This is your “linked” account, and that’s typically the account you’ll use for your initial deposit. Once your online account is up and running, you can make deposits from other sources as well — you can probably even deposit checks to the account with your mobile phone. Spending money: If there’s no physical branch, you may wonder how to spend your money if you need it quickly. Fortunately, some online banks also offer online checking accounts that allow you to write checks, pay bills online, and use a debit card for purchases and cash withdrawals. If you need to move the money to your local bank account, that transfer typically takes happens within a few business days. Plus, some online banks allow you to order cashier’s checks that go out by mail. If you need more than a standard (or online) savings account, there are other types of accounts that pay interest while offering additional benefits. Money market accounts (MMAs): Money market accounts look and feel like savings accounts. The main difference is that you have easier access to your cash: You can usually write checks against the account, and you might even be able to spend those funds with a debit card. However, as with any savings account, there are limits on how many times per month you can make withdrawals. Money market accounts often pay more than savings accounts, but they may also require larger deposits. They are a good option for emergency savings because you have access to your cash, but you still earn interest. Learn more about money market accounts. Certificates of deposit (CDs): CDs are also similar to savings accounts, but they usually pay more. The tradeoff? You have to lock your money up in a CD for a certain amount of time (6 months or 18 months, for example). It is possible to withdraw funds early, but you’ll have to pay a penalty, so CDs only make sense for cash that you won’t need anytime soon. For more information, read about the basics of CDs. Interest checking: If you really need access to your cash (and you still want to earn interest), you might get what you need from a checking account. Traditional checking accounts don’t pay interest, but some types of accounts allow you to earn and spend as often as you want. Online banks offer checking accounts that pay a little bit of interest (typically less than a savings account). Reward checking accounts pay even more, but qualifying can be difficult. With the exception of online banks, savings accounts can be expensive if you don’t keep a large balance in your account. Banks charge monthly fees, and they pay little or no interest on small accounts. For students (who spend most of their time studying — not working), that’s a problem. Some banks offer “student” savings accounts which help students to avoid fees until they get a job and can qualify for monthly fee waivers. If you’re a student, a student savings account at a brick-and-mortar bank or credit union is a great option for your first bank account. Be aware that the account may convert to a “regular” account at some point, and you’ll need to be mindful of fees after that conversion. 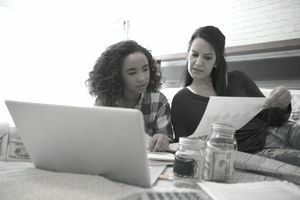 You can save for anything — or nothing in particular — in a savings account, but sometimes it’s helpful to earmark funds for a specific purpose. For example, you might want to build up savings for a new vehicle, your first home, a vacation, or even gifts for loved ones. Some banks offer savings accounts that are specifically designed for those goals. The main benefit of these accounts is psychological. You generally don’t earn more on your savings (although some banks and credit unions offer perks to encourage regular saving), but you might be more likely to reach savings goals if a specific account is tied to something you value. If that sounds like something you’d benefit from, look for “savings club” (or similar) programs. You can also design your own program: See how to do this at SmartyPig, or you can create “subaccounts” or multiple accounts (with descriptive nicknames) at most online banks.